Your Brazilian-straightened hair and American Apparel T-shirts are so out of style... For 1863. According to The Englishwoman's Domestic Magazine, for evening dinner, "hair ought to be dressed in four rolls either side and finished off behind with a Marie Antoinette chignon, frizzed very much." Readers were also advised to carry French canes or walking sticks, and bonnets with "gimp balls" around the brim were de rigueur. A September 1863 issue of the monthly magazine, which was established in 1852, was recently found by an auctioneer during a house clearance in the UK. 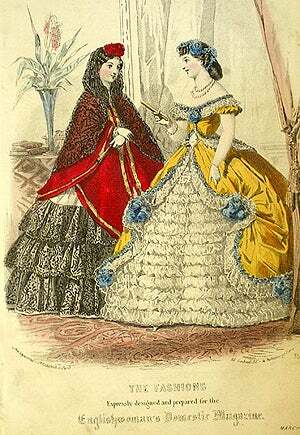 Staying on trend was important to Victorian women — and mismatching colors was a total faux pas! "Wearing every article of the same colour is fashionable only on condition the strictest uniformity of tone is maintained. There is nothing more distressing than seeing a dress of deep blue, inclining to purple, with a bonnet with sky-blue ribbons." Trendspotting back then — much like today — was done in the sea-side towns of France. "The best autumn fashions to be observed are on the shore at Biarritz or Trouville," the magazine notes. "Combs for hair with a sphere of jewels are popular." Even shoes were important! In the morning, one was supposed to wear "elegant little slippers, called mules, with high heels." Later in the day? "Chamois-coloured leather boots, halfway up the leg" were "particularly desired." Keep in mind that the dresses were so long you couldn't see women's feet. Is it any wonder that this country eventually spawned the likes of Kate Moss and Victoria Beckham?